The following document is part of a series produced by the Department of Homeland Security's Office of Cyber and Infrastructure Analysis (OCIA). Though they do not bear any protective markings, the documents are not released publicly. The U.S. Department of Homeland Security Office of Cyber and Infrastructure Analysis (DHS/OCIA) manages the advanced modeling, simulation, and analysis capabilities of the National Infrastructure Simulation and Analysis Center (NISAC). 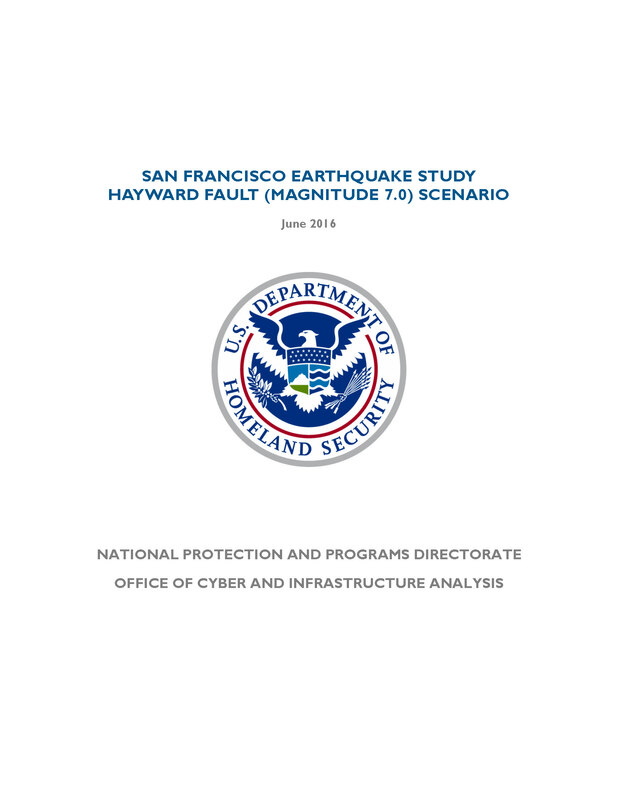 OCIA–NISAC analyzed the impacts to the Dams Sector, the Highway Infrastructure and Motor Carrier Subsector, and the Water and Wastewater Systems Sector after a scenario 7.0 magnitude earthquake strikes the Hayward-Rodgers Creek Fault system in the San Francisco Bay Area. The results of this analysis show a strong earthquake will likely cause significant damage to critical infrastructure in the area affecting 547 dams or water control structures, render approximately 300 roadway segments unusable, and cause damage to 172 water and wastewater treatment systems. The scenario earthquake will likely cause damage to 154 dams in the area. Seven of the dams will likely experience Extensive or Complete damage. The Ward Creek Dam, which is used for flood control, is likely to incur Complete damage. Extensive damage to the James H. Turner Dam poses the greatest risk to downstream population. The earthquake will cause damages to many road segments, bridges, and tunnels in the area. As a result, travel times on these roadways and others will increase significantly. Multiple areas on freeways such as I–680, I–880, and I–580 will have the highest above normal traffic volumes. Several bridges on these freeways will also likely incur Extensive damage. Tunnels in the area will likely have less damage with bores in the Caldecott Tunnel on State Route 24 experiencing only Moderate damage. The earthquake is likely to affect water and wastewater services. The Alameda County Water District is likely to experience the most substantial impacts to water treatment systems. Alameda and Contra Costa County wastewater treatment plants are likely to experience the worst impact. 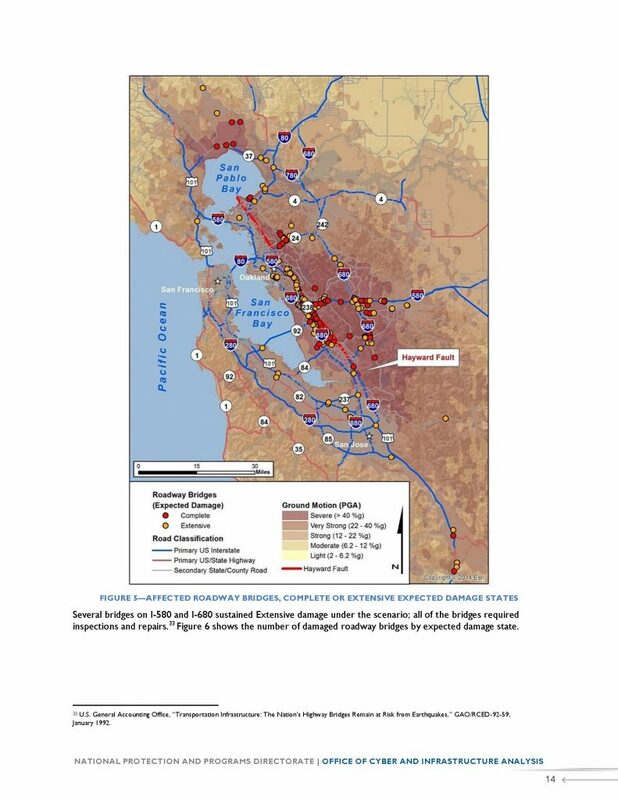 Although ground shaking from the scenario earthquake would occur throughout the San Francisco Bay Area and surrounding regions, the most significant impacts would occur around the Hayward Fault line and regions corresponding to high liquefaction and landslide susceptibility. Five high-hazard dams and one significant-hazard dam are likely to suffer Extensive damage. The Ward Creek Dam, used for flood control, is likely to incur Complete damage. Of the seven Extensively to Completely damaged dams, the James H. Turner Dam poses the greatest risk to downstream population. The scenario earthquake damages bridges, tunnels, and roadways disrupting traffic at numerous locations throughout San Francisco and the surrounding area. Damaged road segments on high-traffic-volume roads under normal conditions are very likely to disrupt traffic volumes and patterns as traffic is rerouted to compensate. In addition to interrupting traffic, losing a roadway bridge can adversely affect other infrastructure: electrical, communication, and additional connections across the span. The scenario earthquake is likely to significantly affect water delivery to consumers. The Hetch Hetchy Aqueduct supplies about 85 percent of San Francisco’s water supply. This aqueduct separates into four distinct Bay Division Pipelines at Fremont, California. All of these pipelines cross the Hayward Fault, and they are likely to experience significant damage. The majority of San Francisco consumers will not have water if these pipelines are out. The Alameda County Water District is likely to experience the most substantial impacts to water treatment systems. The Mission San Jose Treatment Plant is likely to be out-of-service until major repairs are completed. Extensive damage to the Sobrante and Upper San Leandro water treatment plants in the East Bay Municipal Utility District will likely put these plants out-of-service. The wastewater treatment plants that serve Alameda and Contra Costa Counties are likely to experience the worst impact. Five wastewater treatment plants in these counties are likely to sustain Complete damage. Five wastewater treatment facilities serving Marin, San Mateo, Santa Clara, Solano, and Sonoma Counties are likely to experience Complete damage, rendering them out-of-service.